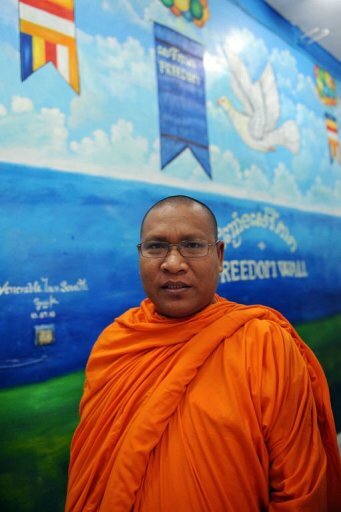 HIS saffron robe a rare beacon among protesters, Cambodia’s most outspoken monk has been banned from temples and risked arrest for challenging rights abuses — but he vows not to be silenced. “The more they threaten me, the more I stand up for our rights,” said the Venerable Loun Sovath, also known as the “multimedia monk” for filming forced evictions and distributing the footage. In a country where Buddhist monks are hugely respected but rarely seen standing shoulder to shoulder with those fighting abuses, his peaceful activism has attracted praise from rights groups — and condemnation from authorities. “Seeing a monk amongst the crowd lifts the spirits of people defending their human rights,” the bespectacled holy man said during a recent interview in the capital, where he joined a rally against deforestation. “Only one of me can make one hundred, 200, 300 people feel strong.” But his tireless campaigning has made the Buddhist hierarchy and the authorities nervous, say observers, who fear for his safety. Police have interrupted his meetings, followed him and cursed at him. He has also been warned that he faces arrest for inciting people to protest. Religious officials have repeatedly ordered him to stop activities or risk being disrobed for disobeying Buddhist discipline, while senior monks have tried to make him sign a pledge promising to cease his activism, Sovath said. Phil Robertson, Deputy Asia Director with the international campaign group Human Rights Watch (HRW), said the monk’s championing of villagers who have lost land to “rich and well-connected persons” makes him a high-profile target. HRW is “extremely concerned” that Sovath, 30, could “face reprisals, and perhaps violence, because what he’s doing is really a challenge to the core of Cambodia’s lawless, might-makes-right political culture”, he said. Sovath, who entered the monkhood at the age of 13, became an activist after witnessing a land grab in his own village in March 2009, when police fired at unarmed villagers protesting against the confiscation of their fields. He captured much of the confrontation on camera and successfully resisted police attempts to confiscate it. Since then, he has broadened his work to speak up for all victims of social injustice, becoming one of the impoverished nation’s leading human rights defenders — and the only one in orange robes. Pressure on Sovath has increased in recent months amid what rights groups say is a growing crackdown on freedom of expression. International rights groups, including Amnesty International, Witness and HRW, recently asked key donor nations to urge the government to stop the threats and intimidation against the monk. “The ongoing government harassment of Venerable Sovath constitutes a veiled attempt by the Cambodian authorities to silence those who speak out on issues that they deem controversial,” they wrote in a letter.